U.S. Concern Grows As Yemen Turmoil Drags On Several times, President Ali Abdullah Saleh has reneged on agreements to step down from power, and clashes have erupted in the capital city of Sanaa. The U.S. is worried not only about the future of Yemen but also about what instability means for counterterrorism efforts. 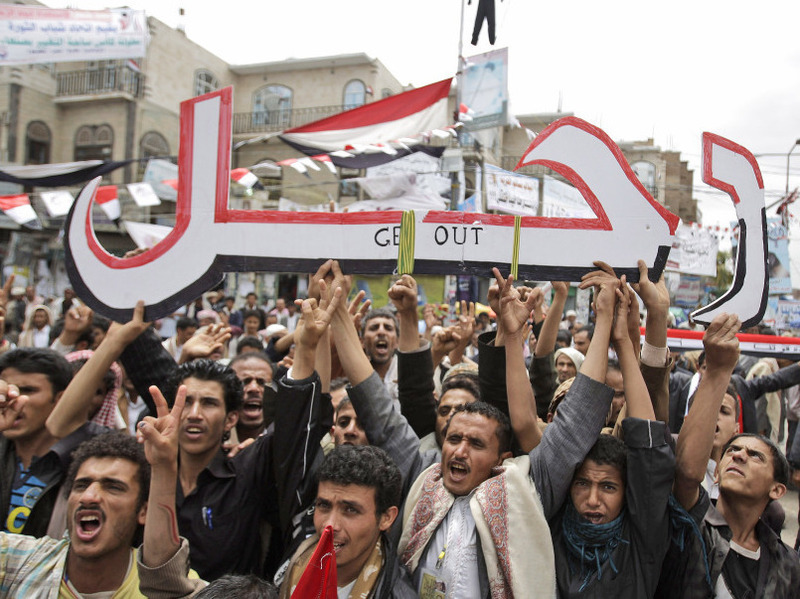 Anti-government protesters hold up a placard that reads "Leave" in Arabic during a demonstration demanding the resignation of President Ali Abdullah Saleh in Sanaa, Yemen, on Thursday. The United States is pulling some of its embassy staff out of Yemen amid a bloody political crisis there. Yemen's longtime leader, President Ali Abdullah Saleh, is refusing to step aside, and clashes have erupted in the capital city of Sanaa. The U.S. is worried not only about the safety of Americans there but also about what instability in Yemen means for counterterrorism efforts against al-Qaida in the Arabian Peninsula, or AQAP. As gunfights raged in the Yemeni capital, Secretary of State Hillary Clinton ordered out nonessential U.S. Embassy staffers. She called on the various factions struggling for control to cease the violence. Clinton also made clear to reporters traveling with her in Paris on Thursday that time is up for Saleh. "We continue to support a unified and stable Yemen, and we continue to support the departure of President Saleh, who has consistently agreed that he would be stepping down from power and then consistently reneged on those agreements," Clinton said. Three times now, Saleh has scuttled a transition plan offered by the Gulf Cooperation Council, or GCC. Bernard Haykel, a Yemen watcher who teaches at Princeton University, says Saleh may be simply holding out for a sweeter deal. "That's one possibility of why he's not signing," Haykel says. "Another is that the GCC has to become much more active in Yemen by supporting opponents to Saleh, by showing Saleh that his chips are up and he has to leave." Haykel says Saudi Arabia will play the key role and the U.S. should be closely coordinating with Riyadh in sending strong messages. Still, Haykel says convincing Saleh to quit will be a big challenge. He says the Yemeni leader likes to keep people guessing. "President Saleh is someone who is very famous for juggling different constituencies, never agreeing to being pinned down to anything," Haykel says. "He does run the country, Yemen — and has for 33 years now — in this very ad hoc-ish [way], always keeping everyone off balance. That's just his style." 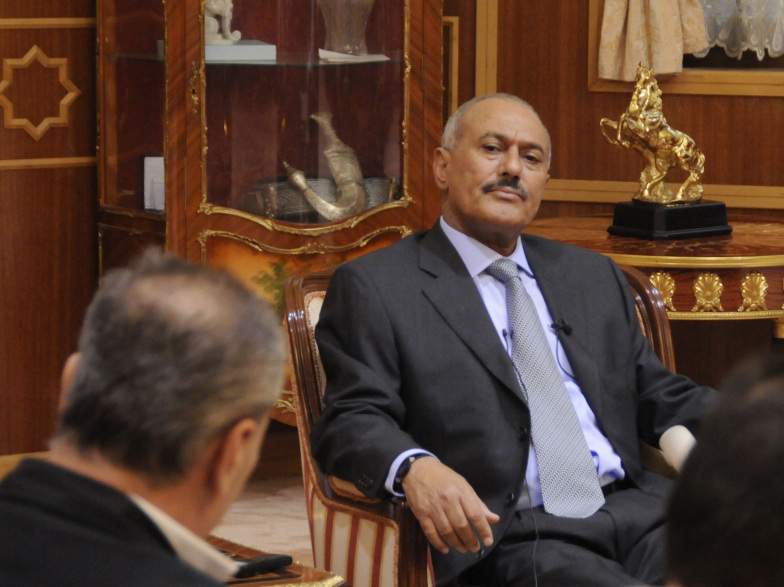 President Ali Abdullah Saleh attends an interview with selected media in Sanaa on May 25. Saleh said he would not step down or allow the country to become a "failed state." It's also his survival mechanism. But analysts are worried about the fate of the country as the increasingly violent political crisis drags on. Christopher Boucek, an associate at the Carnegie Endowment for International Peace, says Yemen and the region can't afford a lengthy civil conflict. "Yemen is already the poorest country in the Arab world, and the average Yemeni is getting squeezed," Boucek says. "We used to talk about Yemen's looming economic collapse. It's now economic meltdown, I would say." And it is not just the economic meltdown that worries U.S. officials. Many here fear that AQAP stands to gain from the political vacuum. Boucek says U.S. officials may not have always been pleased with Saleh, but he has been a partner on counterterrorism, and the U.S. is worried about who might come next. "So there's been some understandable reluctance to want to separate, but very clearly the Yemeni government is not focused on terrorism right now, they're focused on regime protection," Boucek says. Haykel thinks Saleh has overstated the al-Qaida threat, anyway. "I think that they should call his bluff, as far as the threat of al-Qaida. I think that the threat of al-Qaida in Yemen has been overblown by Saleh, and to great effect in the United States," Haykel says. His biggest fear is that the bloody power struggle in Yemen could descend into a full-blown civil war. The State Department is urging any Americans in Yemen now to leave while the airport is still open.